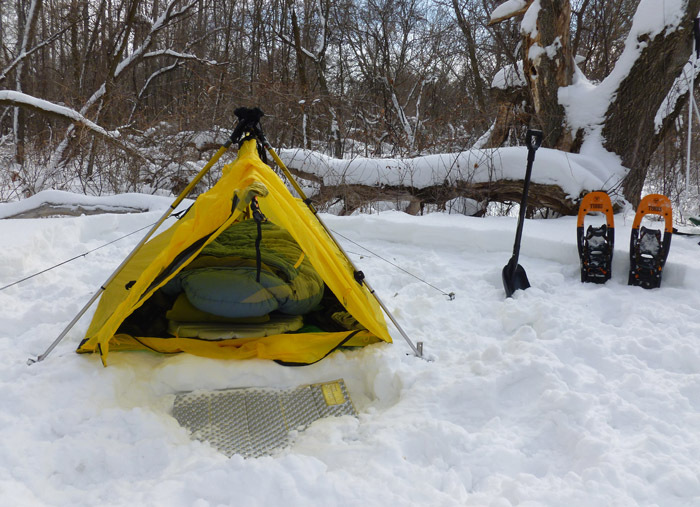 For me the Therm-a-Rest Z Lite Sol pad makes an excellent sit and kneel pad, an R-value booster for pairing with less-warm pads, and a crucial back-up in case my inflatable winter pads ever sustain an unfixable puncture in the field. Plus I can use it to get a face tan like those 1950's movie stars used to. Please read on for the details. 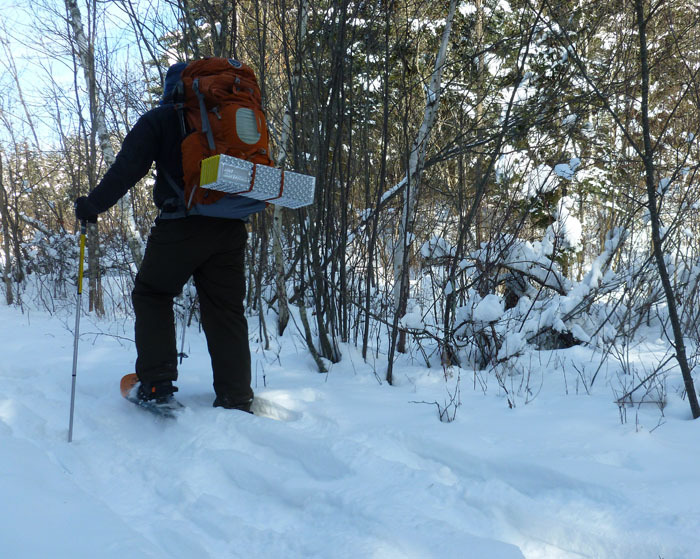 The Therm-a-Rest Z Lite Sol pad (hereafter called the Sol or pad) is the company's lightest foam backpacking pad. The Z Lite Sol is made of dual-density closed-cell foam that will not absorb moisture. It is yellow in color on the bottom of the pad. But the top (sleeping side) of the pad is shiny metallic-looking silver in color. This is Therm-a-Rest's reflective ThermaCapture coating that reflects radiant heat, increasing overall warmth by a claimed nearly 20%. The proprietary foam is softer on top for comfort and denser on the bottom for durability. The over-all thickness is 0.75 in (20 mm), but the thickness of the foam is only 0.3 in (8 mm) thick. The over-all thickness is achieved because of the egg-carton shaped pattern it has been constructed of. This technique allows a lot of dead-air space to be trapped between the user and the tent floor (or whatever it is on). This is claimed to increase warmth and softness too. 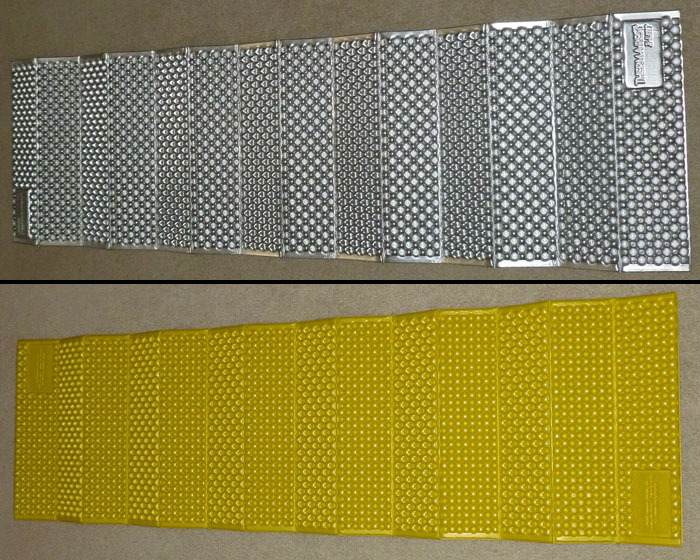 Another thing it does is allows the pad to fold up accordion-style with the yellow bumps of the bottom sliding into the silver depressions of the front. This lets it pack down to about two-fifths of the size its thickness would suggest. It turns into the shiny block seen above. Once unfolded it lies fairly flat. It does keep some shape retention causing it to rise up from the surface a bit. 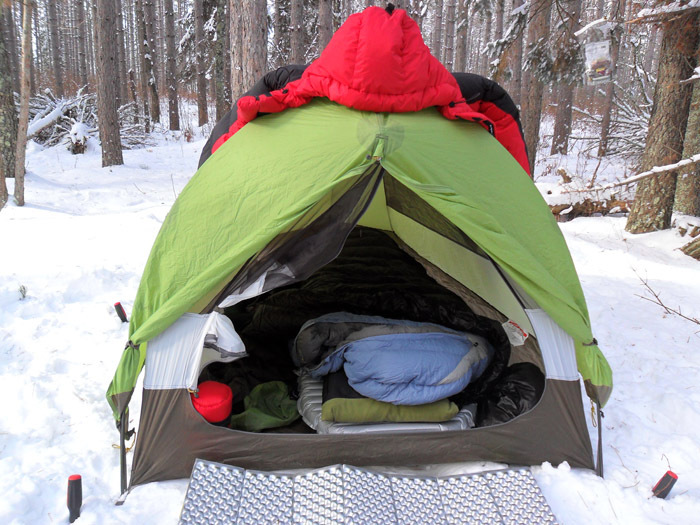 I used the Therm-a-Rest Z Lite Sol pad on every trip in the winter of 2012/13 and a few in this past winter of 2013/14. Above is a picture taken on the North Country Trail (NCT) west of Shingobee. The picture below is at the official NCT Anoway Lake campsite. 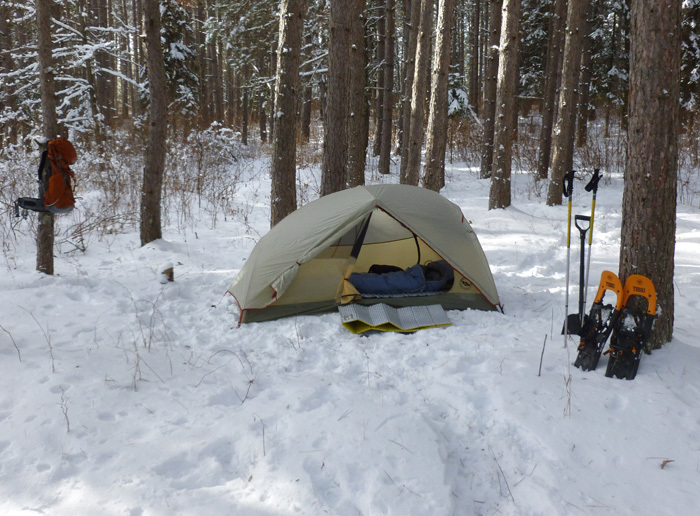 The first winter I used the Sol for two snow-camping trips with my son, and ten backpacking trips. Five were on the Red River either on my friend's property north of Halstad, Minnesota, or north of my own town, three in Chippewa National Forest, one in Smokey Hills State Forest, and the last on the NCT in Paul Bunyan State Forest. These trips were cold with lows averaging around 0 F (18 C). The trip on the Anoway River saw -22 F (-30 C). A backyard test night saw its lowest temp of the year hitting -24 F (-31 C). This past winter I used it for three trips, the coldest seeing a low of -27 F (-18 to -33 C). I got the Z Lite Sol mainly for a back-up pad as I use inflatable pads (either down filled or Therm-a-Rest's own XTherm, see Reviews) for all my winter trips. While snow is pretty forgiving I never know if some weird accident could lead to having a puncture that I couldn't fix leave me with no insulation between my bod and the frozen surface. Since I use quilts much of the time, and a hybrid Therm-a-Rest bag that gets much of its bottom R-value from the pad, the loss of my pad would be pretty ugly. While an R-value of 2.6 is not much, it beats nothing at all. But where it really shines is as a sit pad. I fold it in thirds and end up with a very warm and comfortable seat. I also use it as a kneel pad for going in and out of my tent. It keeps my old knees clean and gives them some needed cushioning. The accordion folding of the Sol works great for playing with the size and shape. When backpacking (as opposed to sled packing where it would be inside the sled) I could choose to use my backpack's sleeping pad straps to carry it in its most compact shape like seen above hiking on the NCT. 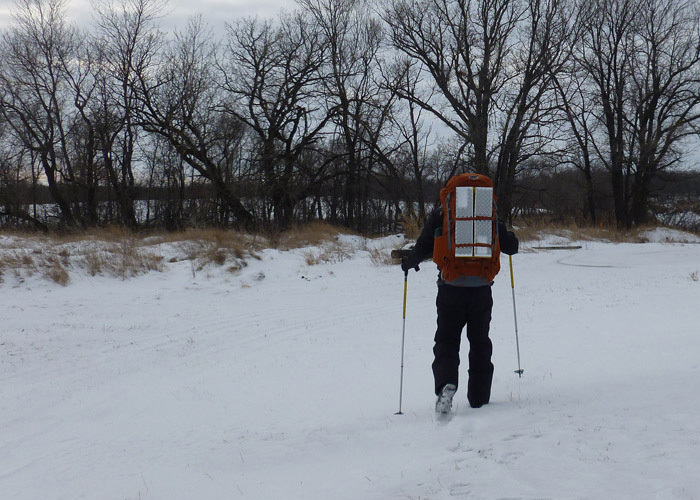 Or I could use the compression/ski/snowboard straps on the back of my pack and carry it spread vertically as seen below in Smoky Hills State Forest. All last winter I used the XTherm exclusively. While its R-value of 5.7 is good for most of the winter temps I see many places, it is not enough by itself in the deep of winter here in northern Minnesota. There were a few times I placed the Sol under the XTherm to give it a higher R-value and hence a lower temperature rating. It works well for this use. In fact since I plan to keep using the Sol as my backup, even when I have my monster R-9 pad along, I will use the Sol under it to not only boost the R's but to protect my down pad from any sharp objects hidden in the snow underneath me. I used to have one of the regular Z Lites (and my kids used them for years, see review). As the cushioning value is the same for the Sol and the regular I know that the Sol alone would not work for me as a stand-alone 3-season pad. I'm a side sleeper and there is just not enough thickness to it for me. So it will continue to ride along with me for my winter endeavors. I leave with a shot of the Sol in front of a funky Propel tent.